Okay, count with us here: How many cars can do 0-60 in 4.8 seconds, circle around a Formula 1 track faster than just about anything other than a full-spec race car, carry four people in true luxury, and cost well under $50,000? None, right? The all-new BMW M5 meets all those qualifications except one, since it costs more than half again as much money. So if you guessed "zero," you win. After the first of January, however, that number will change to "one" with the introduction of the all-new, E46-chassis BMW M3. We recently got to try out this amazing new car not only on the incredible roads of the beautiful country surrounding Jerez, Spain, but also on the legendary Formula 1 circuit that has put this small town in Southern Spain on the map. And when we say we drove the new M3 around the circuit, we aren't talking about touring laps or the type of "hot laps" where you spend most of your energy trying to pacify a nervous instructor. We're talking about all-out, wailing-the-living-hell-out-of-it hot laps. Before we get into the details, let's review a little M history. BMW's M Company originally started out in 1972 as BMW Motorsport GmbH. Starting with the BMW 5 Series, the M Company was formed to build pseudo-factory hot rods out of many of BMW's most popular cars. The legendary M535i, M5 and M635 CSi were built during the '70s and throughout the '80s, while the non-production-based M1 super car was also produced during this period. Up to that point, all M cars featured inline six-cylinder engines. In 1986, these first four models were joined by the four-cylinder, E30-chassis BMW M3. (This car didn't come to the U.S. until 1988.) The original plan was to build 5000 of these two-door sports sedans, enough to satisfy the homologation requirements for European touring car racing, but total sales finally amounted to almost 18,000 units. It was the success of this original M3 that made BMW Motorsport GmbH a serious player in the performance car market. The first M3s featured a 2.3-liter, 16-valve engine (later punched out to 2.5 liters in Europe) that really looked and ran like what it was: a descendent of BMW's former Formula 1 engine. American enthusiasts loved the 192-horsepower engine, as well as the car's light weight (around 2800 pounds) and amazing handling. The only real complaints concerned the uncivilized nature of this thinly-disguised homologation special and the annoying engine buzz at 4000 rpm; some folks also thought the car's over-the-top styling was a little too much. The original M3 was also quite pricey, with an introduction price of $34,800. After a hiatus in the U.S. after the 1991 model year, BMW introduced a kinder, gentler-but ultimately much faster-M3 in the spring of 1994 as a 1995 model. (This car was introduced in Europe in 1992.) The GRM staff, along with the rest of the automotive press in attendance at the U.S. launch, was simply amazed. Based on the sleeker E36-chassis 3 Series, the new M3 was a totally different type of car when compared to the previous model. It had performance that rivaled most any car in the world, yet offered complete civility, four-passenger comfort and genuine practicality. The price tag was perhaps most surprising, especially considering BMW's very steep pricing strategy back in the '80s and early '90s. Despite its refined 240-horsepower, 3.0-liter, inline six-cylinder engine (later enlarged to 3.2 liters), leather interior, complete complement of power options and all the goodies, the car carried an introduction price of $35,800-almost the same as the much less sophisticated and less-equipped original M3 of six years earlier. The press raved, and buyers flocked to the new E36 M3. When all was said and done, the 1995-'99 BMW M3 came off the line in the German town of Regensburg with a production total of 71,279 coupes, sedans and convertibles. Given this history, the new M3 has quite a legend to live up to. Naturally, the styling for the new M3 is based on the E46-chassis 3 Series Coupe, introduced to U.S. buyers as a 2000 model. 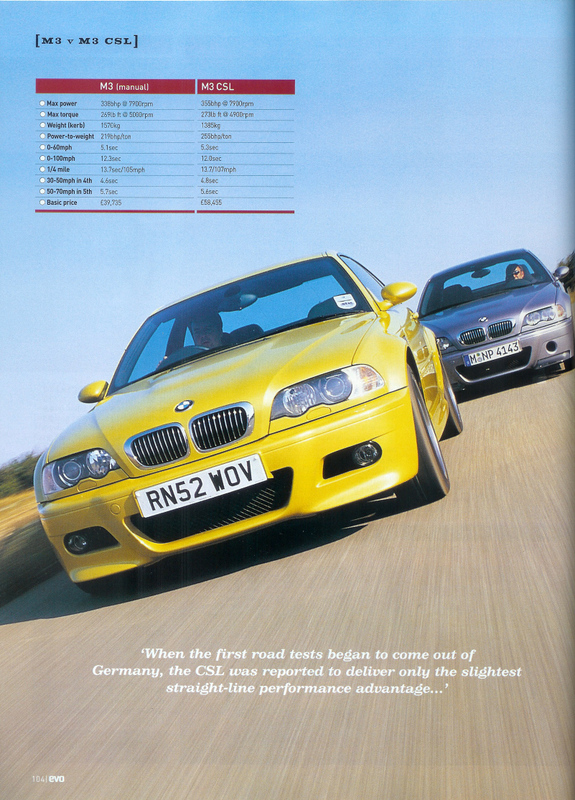 As we explained in the February 2000 issue of GRM, the current 3 Series Coupe is a good bit ahead of its predecessor in the comfort, refinement and styling departments. So, by default, the new M3 should be better in these areas than earlier examples. Subtly-flared fenders cover the wide tire and wheel package, while other distinguishing features include an aluminum "power bulge" hood (supposedly to clear the engine), front air dam, two sets of twin exhaust pipes and a very minimal real spoiler. Chrome cooling grille covers on the front fenders (like the BMW M coupe and M roadster) are perhaps the most distinctive design feature. We were never a big fan of this retro design touch on the M roadster, but fortunately these grilles are a bit more subtly implemented on this car. The look of the new M3 slots right between BMW's previous incarnations of the car. Some people complained that the E36-chassis M3 didn't look much different from a run-of-the-mill 328i, while the boy racer look of the original car had its critics. BMW public relations people tout the new M3 as being far more aggressively styled than its predecessor, though we don't see it. Being boy racers both at heart (and in practice), we would have to assign ourselves to the "more is better" school of thought. The new M3, while certainly not garish or overstated-except for the chrome vent grilles on the front fenders-comes off as muscular, purposeful, yet in our opinion too understated. We feel the new car is perhaps even more understated than the E36 M3, and certainly way more subtle than the E30 M3. The aftermarket will have a field day with this one as they find new ways to give owners of the new M3 a more in-your-face look. There are a lot of things to like about the new M3, but by far the best thing is the engine. While still an inline 3.2-liter (technically, it now measures 3246cc), six-cylinder like its predecessor, BMW claims that 95 percent of the engine is all new, with only minor parts, like seals and sensors, being carried over. The only other features carried over from the former M3 power unit are the main dimensions of the engine and the quasi-dry sump system integrated in the oil sump. The new engine makes 333 horsepower at 7900 rpm in U.S.-spec form, which is only 10 less than its European counterparts. (Half of this difference comes from the use of SAE horsepower numbers, while the other is due to U.S.-spec catalytic converters.) The new car also makes 262 ft.-lbs. of torque at 4900 rpm, with 80 percent of this lofty torque figure available at just 2000 rpm. Although engine capacity has been increased by only 1.4 percent over the previous model, the many modifications made to the new engine boost engine output by 6.9 percent and torque by 4.3 percent. By comparison, the 3.2-liter engine used to power the previous M3 made 240 horsepower at 6000 rpm and 236 ft.-lbs. of torque at 4250 rpm. As is typical with BMW, some pretty neat features account for this impressive performance. First, the new engine is six percent lighter and has a lower center of gravity than the old E36 M3 engine, thanks to a completely redesigned valve train. This new valve train features anti-friction followers that apparently offer significant advantages in terms of lower friction and moving mass over the old-style cup tappets, given the limited space and small dimensions available. Compared with the cup tappet valve drive, oscillating masses are reduced by 30 percent. This allows a reduction of valve spring forces and, accordingly, of friction losses and fuel consumption. Other really trick features include graphite-coated, cast-aluminum pistons with a specially-machined crown that allows an unheard of (in a production street car, at least) compression ratio of 11.5:1. These and other improvements have allowed maximum engine rpm to rise significantly. The old M3 would pull 6500 in top gear and 6800 rpm in first and second gear; the new car will rev to 8000 rpm. BMW's VANOS variable cam timing setup on the intake and exhaust camshafts, which made its world debut in the E36 BMW M3 back in 1992, again helps maximize performance on the new M3. VANOS is essentially BMW's version of variable valve timing and allows the angle on the intake camshaft and exhaust camshafts to vary at low and high rpm for maximum performance and efficiency. As opposed to the former model, the new BMW M3 now features six individual throttle butterfly housings instead of three double housings. Even tricker are the six intake funnels in a large air collector and the six individual throttle butterflies. Both the air collector and the funnels are made of a light composite material with 30 percent glass fiber; together, they form one complete unit. BMW says this intake system was designed by their Formula 1 racing department. So, what does all this mean in the real world? Well, quite honestly, a lot. The new M3 has what is most likely the nicest, smoothest engine we have ever driven. Acceleration from zero to 60 mph takes less than five seconds, and the electronically-limited top speed of 155 miles per hour is not at all far-fetched. All numbers aside, the engine is just amazing on the race track. Torque is everywhere, with no dead spots anywhere in the rev range. Most corners that would require a downshift to second gear in other cars can easily be taken in third gear. With an 8000 rpm redline and maximum power near the top of that redline, we found the engine to be extremely flexible on the race track. It just pulled and pulled and pulled. Trust us, this engine will have to go down as one of the best ever built. The six-speed manual transmission is carried over from the previous non-U.S. spec M3. (The U.S. E36 M3 was equipped with a five-speed, however). The final drive is now 3.62:1, lower (numerically higher) than the previous car. BMW states that the increase in final drive ratio is because the new engine can rev so much higher. With a six-speed transmission, you would think that there would be no gaps between gears. Curiously, on the M3, the gap between second and third feels a little wide when downshifting during spirited driving. The specs back this up, as the second-gear ratio is 2.528, whereas the third gear ratio is 1.669. Fourth through six are 1.226, 1.000, and .828. First gear, by the way, has a ratio of 4.227. Naturally, transmission ratios do get closer as you go through the gears, but we feel a minor revision would be helpful between second and third gears in this case. The new M3 is equipped with a variable M differential lock, as opposed to the old M3 which came with BMW's traditional clutch-type, self-locking differential which featured 25 percent locking action. On this torque-sensing differential, the total drive force the system is able to transmit is based on the power that the wheel with the lowest amount of traction is able to convey at any given time. The new system relies not on this wheel's traction or lack thereof, but on a pump that pushes fluid into a multi-plate clutch that immediately transfers power to the wheel with more traction. Bottom line: The new system works better, especially in adverse conditions like snow. When we heard about this new system, we were skeptical. It sounded complicated, expensive and heavy. Not true. This new limited-slip differential appears to be no more complicated nor heavy than the previous one. Out on the race track it works flawlessly. In fact, we specifically noticed how smooth and perfectly this new differential works in all conditions we encountered. The inside of the new M3 obviously also mimics the "regular" 3 Series Coupe. This means there is more rear leg room than its predecessor, and the interior is a bit further refined in other areas as well. Like the new M5, the new M3 features a variable warning zone tachometer: Whenever the driver starts the engine cold, orange light-emitting diodes (LEDs) come on at an engine speed of 4000 rpm, then extinguish at increments of 500 rpm as oil temperature increases. As soon as there is only one orange and two red LEDs left on, the engine has reached its optimum operating temperature. While this may be a clever gadget, we hope that our readers have enough common sense to wait for the engine to properly warm up before they hammer it, without fancy gauges to tell them so. Enough said. The newly-designed M multifunction steering wheel feels very comfortable and is perfectly sized for the car. Front, side and head airbags are standard to protect the driver and front passenger, with two side airbags available as an option on the rear seats. For the first time, the M3 now comes with sports seats that feature individual backrest width adjustment. The idea in developing these seats was to considerably enhance side support without requiring drivers of different sizes to make any compromises in terms of seating comfort and relaxation on long distances. Perhaps these new seats are a good idea, but in our experience, the fancier you make power seats, the more things there are to break, the more weight that is added to the car, the more expensive they are, and the more difficult it is to find a comfortable driving position. The interior is rounded out with a footrest in aluminum as well as door cutout strips with the M3 symbol. While much of the M3 is new, the front suspension is nearly identical in design to its predecessor. However, like the rest of the new E46-chassis lineup, springs, shocks, anti-roll bars and other hand parts are not compatible with the older chassis. Like the the rest of the new 3 Series cars, a lot of the M3's steel suspension pieces have been remade in aluminum to save weight. One of the biggest changes to the front suspension is the newly designed "thrust plate." This 3mm aluminum plate is bolted to the bearing points of the two front control arms. Supposedly, by better dispersing cornering loads, this thrust plate helps the car handle better, especially in high-speed, steady-state maneuvers. At the rear, again the design is similar to the old M3, but more aluminum is used than in the past. Modifications were made to the rear axle subframe as well as the final drive bearings. These specs obviously add up to one hell of an automobile. On the wonderful back roads of southern Spain, the M3 did virtually everything well. Acceleration was electrifying, braking was stellar, and the whole fit, feel and karma of the car were exquisite. One real complaint was that the ride quality could be judged somewhere between a little stiff and tiring. Quite possibly, with a little more break-in time or equipped with the U.S.-spec 18-inch wheels, ride quality would have fared better. The suspension never crashed over any bumps, but the overall effect over a three-hour ride was one of the car being too stiffly sprung and not damped firmly enough. Essentially, on back roads, you could get seasick in the new M3. On the race track, the suspension felt perfect. There was almost no body lean, and the car was completely composed under acceleration, braking, and transient and steady-state cornering. This composure remained intact, even at the indecent speeds one might encounter in an actual road race or track event. Despite being awesome on the race track, there were a few complaints. For one, the increase in weight is apparent. The new M3 weighs 3415 pounds, a bit more than the 2800 pounds of the first M3 and 3175 pounds of the second one. While the brakes never gave up, they did get hot on the test cars and began to get a bit soft. Naturally, race pads would help this problem, as would lightening the car. Again, on the street, you would never notice this problem, and it is most likely easily solved under most race prep rules. 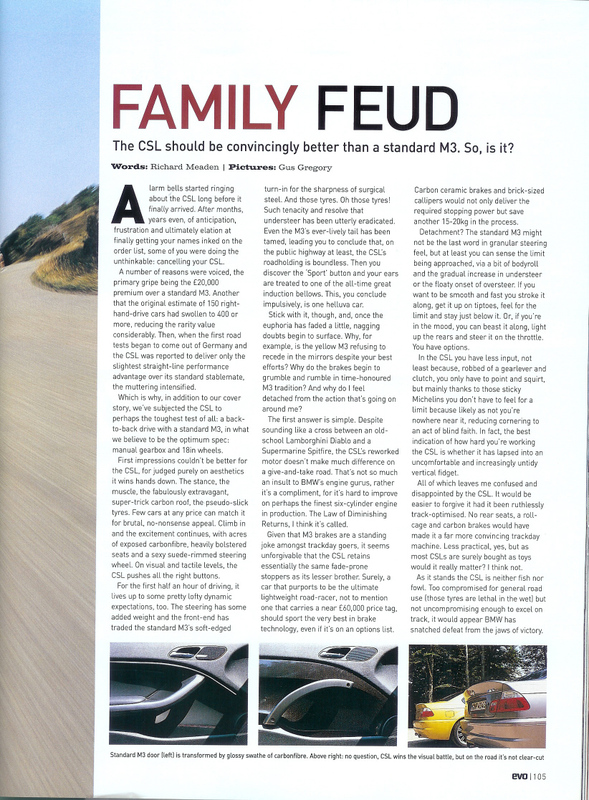 The only other blemish on what is arguably the best car we have ever driven is the extreme-low-speed understeer that mars the handling. While it's fine in high-speed corners, we had trouble preventing a push in every tight, low-speed turn at the Jerez race track. Bringing out the rear end was impossible with the DSC (traction control) engaged, and difficult with it disengaged. The car sticks so well with the huge Michelin Pilot Sport tires that the rear end didn't want to come out in the corners. On the one hand, this is great, but on the other hand, when battling an understeer problem, an experienced driver will want to hang the tail out some. The weight bias is 51 percent front and 49 percent rear, so this is not a design problem. In fact, when queried, BMW engineers quickly admitted that the understeer was built into the car for safety reasons. Those readers who race these cars will want to design this low-speed understeer right back out. Changing springs and anti-roll bars will most likely quickly accomplish this goal. The new M3 has a lot to live up to. Its two predecessors are destined to make just about anybody's list of all-time great cars. This latest M3 should continue that tradition. As is typical of BMW, the new car is subtly upgraded in all areas-except the power train, where nearly 100 additional horsepower can not be considered subtle. The car has phenomenal poise, power and panache. It is destined to be a major success. In a perfect world, we would like to order the as-yet nonexistent club racing version. 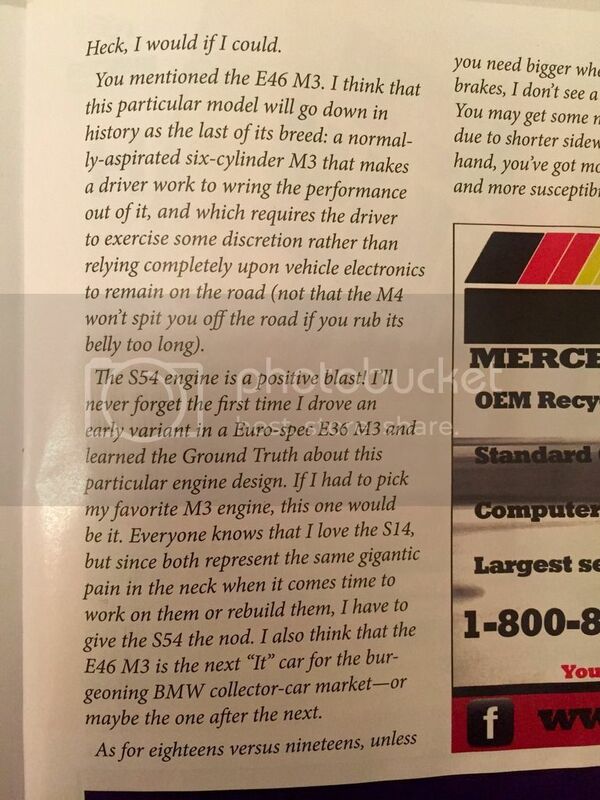 (There was a lightweight club racing M3 built for the 1995 model year.) This one would be 500 pounds lighter, $5000 less expensive and without all the doodads that add price and weight. In the meantime, the stock E46 M3 would do just fine. 0-60 in 4.8 seconds and 8000rpm redline. The S54 was so ahead of its time in the year 2000. It's still such a performance bargain today. Love my 06zcp. All times are GMT. The time now is 10:29:51 AM.